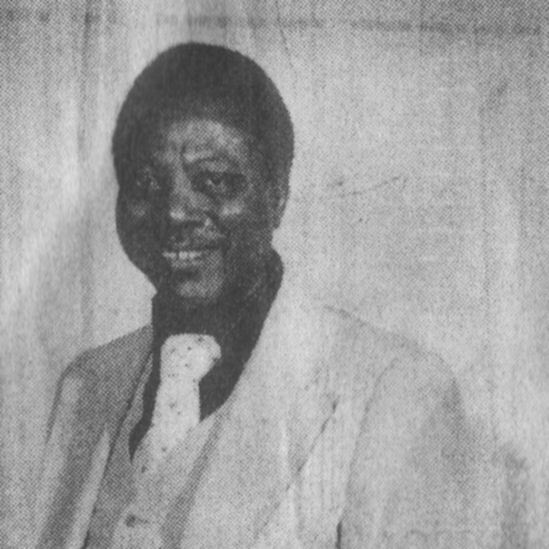 Oscar Mack worked for Otis Redding as an opening act on his early 60s tours, as well as a valet, chauffeur and general factotum – and no doubt got his chance to cut at Stax through the Great Man’s good offices. I love the loping Don’t Be Afraid Of Love with it’s wonderful “loose” R & B feel set up by the superb drumming. And lthough the Big O sang the second vocal on Oscar's "Dream Girl" he certainly isn’t singing on this cut - but he did record his own version of the song which remained in the vaults until 1990. 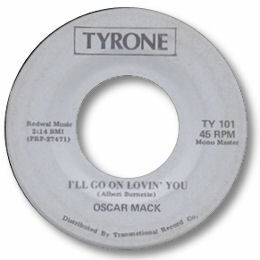 The second Stax 45 sadly isn’t up to the standard of the first but if you want to hear what I like to think of as the real Oscar Mack check out his later 45s. I'll Go On Loving You is wonderful deep soul - chock full of the right stuff. A super melody beautifully phrased by Oscar, backed by a tasteful organ/guitar combination and a very well arranged horn section. I’m Glad Its Over may just be even better. Sure, his phrasing owes a big debt to Otis but the grit is all his own and his cracked, wracked emotion is all too obvious. The song is excellent Southern Soul in the grand manner – the “climbing” horn chart is a real joy. This was released by Amy (see note 2 below) in early 1968 so it’s a fair bet that this peach was cut, probably in Florida, the previous year. Ulysses Miller, who was part of Oscar's road band, reports that "I was only 17 years old when I join the band and Oscar was the father figure who watched out for me on the road trips. He was really a great person, always playing jokes on people and keeping everyone laughing. I remember we played a club in Ga. when OM was heckled on stage - his response was: "Would somebody please put something in his mouth, my zipper is stuck" The club exploded in laughter. He had great showmanship skills on stage, always 110% effort. At the end of each and every show he would be soaking wet from perspiration. He always dressed in a 3 piece suit, but that didn't stop him from doing flips on stage." Sadly, Mack died in Detroit in 1989. UPDATE ~ My friend Dave Porter reports that Mack was a member of the James Duncan Trio in it's early days. NEW UPDATE ~ I am delighted to report that I have been contacted by several members of Oscar's family. They have kindly contributed the photo now on the page and also further details of his life. I am particularyl grateful to Tamika Turner and Patti Kryzanowski for their help and encouragement. 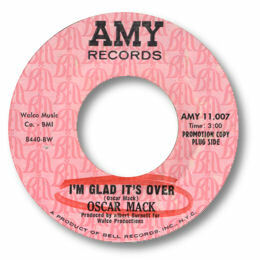 FURTHER UPDATE ~ I have found another terminally obscure 45 by Oscar Mack, hiding as one half of the duo Oscar & Steve. You can find it here. 1. Both sides of the fabulous Walco / Amy 45 can be found on the Sundazed CD “Looking For My Baby” (SC 11125). The version of "I'm Glad It's Over" is several seconds longer than the 45. 2. Conventional wisdom is that small label releases precede the larger ones - but in the case of "I'm Glad It's Over" I'm not so sure. The Walco 45 loks and feels like a 70s release, and Alan Walden was unaware of it till very recently. Also the number of the record - the only known one on the label - is suspicioulsy similar to the Amy disc. So the Walco may be a later, possiby even dubious, release. Thanks to Ulysses Miller, Alan Walden and Terry Stinson for enthusiasm and info, and to Naoya Yamauchi for the music and scan of the very rare Tyrone release.